Everyone, Mexicans and tourists alike who get beyond the beaches and colonial towns love Guadalajara. In four years living in Mazatlán, I never talked to a single Mexican who didn’t talk somewhat wistfully about Mexico’s second largest city. Beyond the consensus of being exciting and beautiful, another takeaway from experiencing Guadalajara has been discovering the big demand there is for English teachers which I’m sure exists in Monterrey and Mexico City too. Students and professionals all over Mexico scrabble for proficiency in the “language of business” (as opposed the language of love, French, or the language of God, Spanish) English is an edge for striving Mexicans in tourism obviously but also engineering, technology, and healthcare, practically every industry. If the scarcity of obvious Anglos among the masses of people I saw in the plazas and popular hang-outs in Guadalajara is any indication, demand for English teachers must be huge. Visiting one large college campus language department, not a single teacher whom I met was a native speaker. Getting certifications in different professions always fired me up. As a recruiter, I obtained my CPC (Certified Personnel Consultant) at 22. As a career fundraiser for the Boy Scouts of America, I achieved the far more difficult CFRE (Certified Fundraising Executive) certification too. While the certifications never got me a job, they were validating. Thinking that a little part-time work in Mexico teaching English might complement my solitary hours writing, I dove right into investigating getting an ELS certificate (English as a Second Language). What I discovered was discouraging. Certification programs ran between $1,200 and $2,500 dollars. While the tuition is not outrageous by American standards, if you are planning to teach in a Spanish-speaking country like Mexico, you will only make around 200 pesos an hour when starting out. That means it will take 40 hours a week of teaching for three months to recoup your investment, not counting the minimum four weeks you will spend in the program. The chance of working 40 hours a week right away as a newly-minted teacher is negligible. Most teachers have to patch together a number of part-time jobs and/or find private students. Later, you might develop a base of private lessons or more lucrative corporate work. Thinking back to my own past certifications, I realized that I only pursued them after a few years of experience in the field, after I’d ascertained my long-term interest. So how, I wondered, would a person get started teaching English in Mexico in small, inexpensive way until they figured out if they liked it enough to invest in the certification? As a retired or semi-retired expat, you probably aren’t going to aspire to teaching in a university classroom, nor will you likely to be up for eye-rolling, slouching middle-school students. Like many expats, I’d like to teach maybe four or five classes a week, understanding that prep time will probably equal classroom time until I have a repository of lesson plans banked away. Fabiola Rodriguez Licona lives in a suburb of Mexico City called Texcoco. Before obtaining her own ELS certification, she came up with ingenious ways to get experience and students. While she no longer teaches, she shared the process she developed to get her in the game without the steep initial outlay of time and money. Mexican students seeking to go to graduate schools in the United States and Europe are required to take a language proficiency test, called the TOEFL exam (Test of English as a Foreign Language). Similar tests are the IELTS exam (International English Language Testing System). The tests are administered on-line at testing centers and takes about four and a half hours. The standardized test measures speaking, writing, listening and reading skills. Like LSATs for law schools, students often take preparatory courses for these exams. Fabiola downloaded and studied the preparatory course materials, took the test herself, and then developed her own syllabus for teaching clients how to prepare for the exams. Taking the exam costs around $200 dollars (Surprisingly, it cost just a much to take the exam in Mexico as it does in a testing center in the U.S). “By taking it myself, I knew both the material and the experience of taking the test,” she said. You can download materials for free. Fabiola also taught online through a website called ITalki, one of a number of sites from which students of English can choose among hundreds of online teachers. Presently she writes a blog called My Heart of Mexico, focusing on healthy living. “Teaching English takes a lot of energy and preparation,” she said, something she couldn't maintain after the arrival of her third child. As an avid student of Spanish who has worked with many adult English students in Skype language exchange practices, I think that anyone who is seriously studying Spanish has what it takes to teach English. “There are many courses and methods of teaching but in the end, you have to adapt to the needs of the students. Sometimes you have to throw those books and methods out the window. You may have your plan and students don’t respond to it, so you have to change things completely and improvise," affirmed Fabiola. As a language student yourself, you will know how easy it is to get bored. You learn quickly that you need to spend time with grammar and verb conjugation. You are already familiar with online vocabulary tools and language learning resources. You know how hard learning a second language is and are bound to be more patient. If you have been practicing English/Spanish exchange with various partners online (through sites like My Language Exchange and Conversation Exchange), you will already know that each person needs an individualized approach. Among my own practice partners who are learning English, some strictly want to talk and be corrected. Others want the occasional structure of reading out loud to practice pronunciation or translating articles by paraphrasing them. If you’re an engaged language partner, you begin to see what works in terms of process and motivating someone. The beauty of teaching English today is that all the tools you need to prepare an individual English lesson are at your fingertips, online and on YouTube, right down to being able to Google “How to teach progressive tense in English.” All you need is decent research skills and a genuine enthusiasm for teaching to put together a satisfying teaching session. For teaching in Latin American countries, some Spanish is useful but many people think immersion, where only the language being taught is spoken, forces the student to learn faster. Tom Campbell, a teacher who has a website and blog called, No Hay Bronca, gives what I think is the best advice: Remember who your customer is. I’ve taken Spanish classes where the teacher did all the talking. It was excruciating. His advice will resonate with anyone who has tried to learn a second language. You want to talk as much as possible. Most everything else; reading, vocabulary-building, listening, you can do on your own. What luck to be born a native English speaker! A number of people young and old (like the 80-year old parents of a friend of mine who teach English when they’re in China) travel the world teaching English. If you’re a potential expat wondering how you might contribute your skills in a host country, teaching your mother tongue undoubtedly can be a gratifying, flexible option. These undiscovered gems are great tools for helping students or Mexican friends learning English. Next up: Is it time to cut bait in your search for a job in the U.S.? Tired you say? Think again before you utter that in Mexico. Hi, I'm Kerry Baker, a partner with Ventanas Mexico and the author of two books. The "Interactive Guide to Learning Spanish Free Online" is a curation of the best free tools to learn Spanish on the web. Interactive links in this book will take you to free learning sites and/or features that you will never discover on your own and are ones Google Ads prefer you not know about. Use these tools to create unique lesson plans every day. Never get bored. 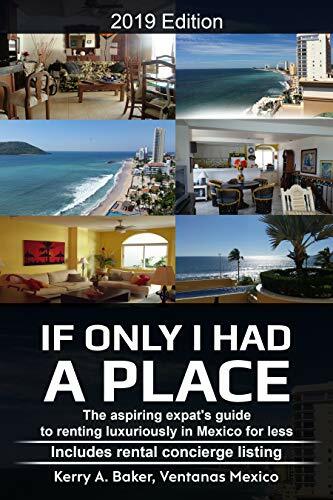 "If Only I Had a Place" is a book on renting longer-term in Mexico, explaining the cultural advantages and dangers or being an expat renting in a foreign country. The book includes a listing of rental concierges, ambassadors to preview places for you before sign the dotted line.